I wrote about American R&B star Drake before, saying that even though he had no music on sale he still had a dedicated site to sell ringtones from the songs he was streaming on P2P sites and elsewhere. Now he's signed, and ready to release his album. It's a bit of an object lesson on how to market music in 2010. The three cleverest things are the url, the packages, and the instant download for pre-orders. First, the url - ThankMeLaterJune15.com - no messing about there. Presumably the plan is to do this for each future release. Then the packages - 4 different ways of buying the album from the 'Super Deluxe' at $29.99 to the 'Digital Version' at $13.00. The 'Super Deluxe' comes with a T-Shirt, poster, and sampler for other acts on the record label. All of them, apart from the 'Digital Version' come with some kind of physical souvenir, like a poster or T-shirt. Finally, the best thing is that if you pre-order you can immediately download two Drake tracks that are on the album - that's a pretty good incentive to pre-order rather than wait until it comes out. Elsewhere on the site you've also got 90 second samples of two songs, and an embedded Vevo video player. Drake's most recent song on Vevo has had 9 million views in 6 weeks. Let's see how much of a splash this one makes! I'll update in June. 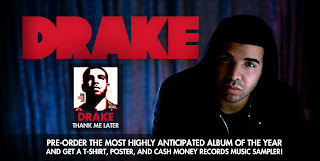 Update - 3rd June - The album is apparently leaking online, 2 weeks ahead of release, and Drake is fine about it. "I gave away free music for years so we're good over here ... just allow it to be the soundtrack to your summer and ENJOY! JUNE 15th!" he wrote on twitter. It is a different music industry these days. Great for this kid, he used his context very well.